Weapon Ranges | The Engines Cannae' Take It! Although all starship weapons in Star Trek: Online have the same maximum range of 10km, it’s been mentioned several times by the developers that different weapons are affected by range at different rates. This article presents the results of in-game testing done to determine what those differences actually are. 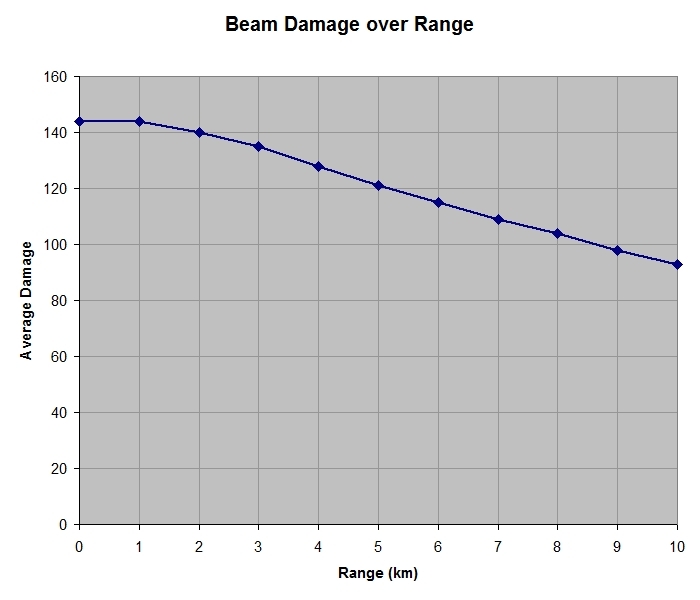 Allowing for a margin of error in the data, then, it appears that beam weapons do maximum damage up to 1km, and then start to drop by around 4% damage per km, down to about 65% damage at 10km. 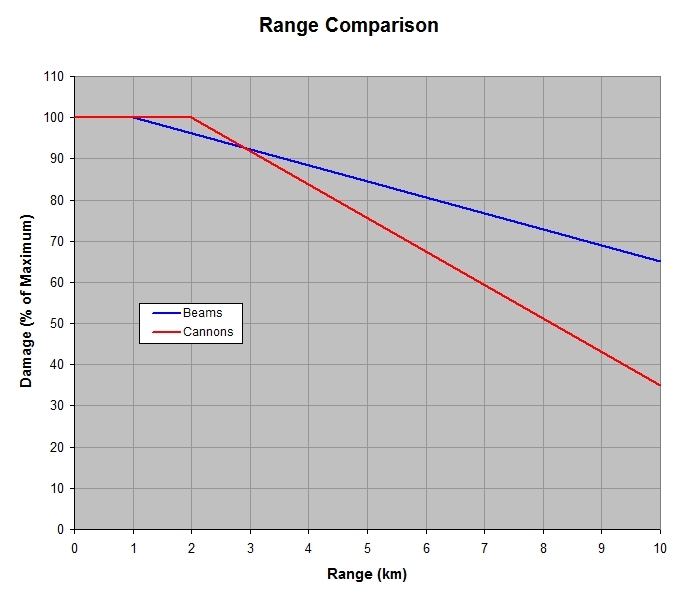 I haven’t yet done extensive testing with dual beams or other damage types, but some quick comparisons of damage at 10km and 1km with a variety suggests that all beam weapons are affected by range in a similar fashion. 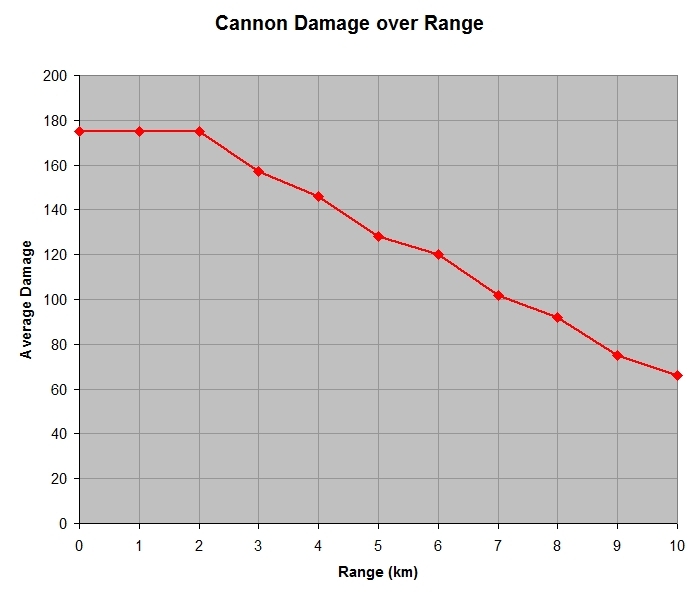 Once again allowing for a margin of error in the data, it appears that cannon weapons do maximum damage up to 2km then start to drop by around 8% damage per km, down to about 35% damage at 10km. I haven’t yet done extensive testing with cannons, dual heavy cannons, or other damage types, but some quick comparisons of damage at 1km, 2km and 10km with a variety suggests that all cannon weapons are affected by range in a similar fashion. I haven’t been able to do extensive testing yet, but a comparison of turret damage at 1km, 2km and 10km suggests that they are affected by range in exactly the same way as cannons, which matches with dev statements that turrets are counted as cannons for the purposes of range. The upshot of all this is that those captains utilising a weapons load-out that favours cannons or turrets need to be much more aware of the range to their target than those who favour beams. This is particularly important when using abilities that boost weapon damage in general (such as Emergency Power to Weapons or Tactical Team) and cannons in particular (such as Cannon: Rapid Fire). As all these abilities modify your current weapon damage, and that damage is significantly reduced by range, triggering them at long range in a cannon or turret-armed ship can waste a lot of their potential benefit – in general, it’s better to wait until you’ve closed to within 4-5km or less. I haven’t managed to do much testing of torpedoes, for the simple reason that they do so much damage against unshielded stationary targets that they tend to be destroyed after only a few shots, making it rather laborious to get enough damage values for comparison. The data I have gathered would tend to suggest that torpedo damage is unaffected by range (or affected to such a small degree that it’s within the margins of error for the sample size I have so far). I can’t escape a sneaking suspicion that torpedo damage could be affected by ‘time to target’ – in other words, the longer it takes a torp to connect, the less damage it does when it gets there. If this is the case, it would probably require testing against fast-moving targets to confirm, as the time it takes for a torp to hit a stationary target when fired from 10km may not be enough for this effect to become particularly noticeable. Of course, this is pure speculation on my behalf at this time. However, there is plenty of anecdotal evidence to suggest that the accuracy of torpedoes may be affected by range. 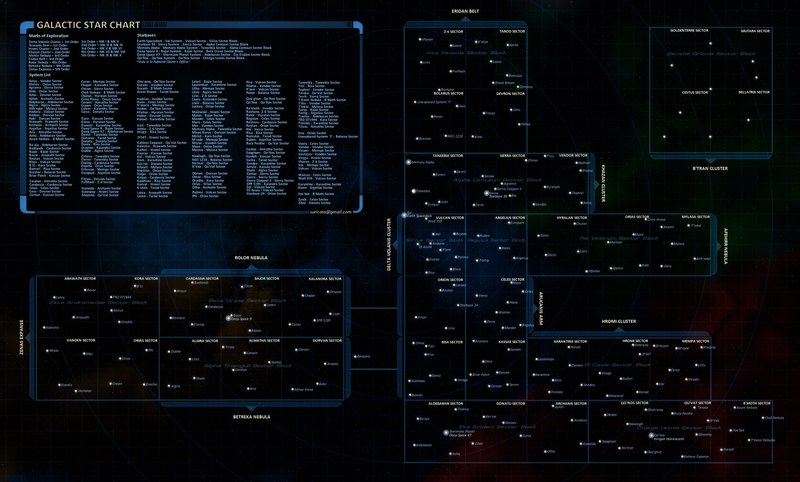 It’s clear that the Star Trek: Online space combat system has some form of ‘to hit’ check – attacks from both players and NPCs can result in a miss, there are weapons and traits that give accuracy bonuses, high speed is supposed to make you harder to hit, and abilities like Evasive Maneuvers give defence buffs. Unfortunately, what’s not clear at the moment is how this system works, and whether range plays a part in it (although I rather suspect it does). I’m very much hoping that one of the devs will provide an overview at some point. My impression so far is that ‘base accuracy’ is 100%. At no point in any of the testing done for this article did an energy weapon or torpedo fired from a stationary ship at a stationary target result in a ‘miss’ – every single shot connected, regardless of range. Interesting info, thanks for sharing this with us. Still, there are two things that bugs me, and if i find some time to research those i’ll drop by some info. 1. Does energy power setting affect raw damage only, or does it affect falloff too? You mentioned your power setting was constant, but at what rate was it? 2. You mentioned you used different types of targets (“defence turrets, mining facilities and the like”). Were they mixed at different range? What i mean, they could have had different damage resistances. So if, let’s say, 5km range was tested on turrets, and 8km was tested on mining facilities, the results could be inacurate. 1. As far as I’ve been able to tell so far, all damage modifiers are cumulative, and weapon power level has no direct relationship with range. For example, a beam with a base damage of 100 at 50 weapon power will do 100 damage at 1km and around 65 damage at 10km. Increasing the weapon power to 100 will increase the damage by 100%, so it’ll do 200 at 1km and 130 at 10km. I will put it on my list to check this specifically, but it’s how it seems to work from playing around with it. 2. Sorry, should have been clearer – each weapon type was tested against the same target at all ranges (normally by restarting the mission or flying away and letting the target heal up). 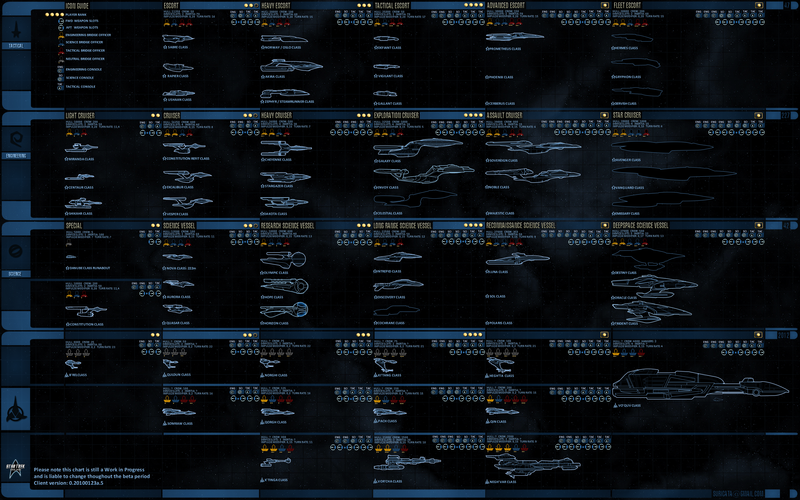 Different weapons were tested in different missions, sometimes with different characters and/or ships. Another sticky for the guild site. Worthwhile to consider: what matters in the end is how much damage your weapon is putting out. It might be a nice addition to your battery of charts to do a raw damage overlay, which I believe will show that cannons provide more raw damage beginning around 7k. I’d also be interested to see whether weapon types are affected differently by Weapon Power (ship power distribution setting). The ‘raw damage’ chart is a nice idea. I’ll definitely add it to my list. My experiences with weapon power so far are that it affects all energy weapons at the same rate of +/- 2% damage per point of power above or below 50. Shouldn’t you be able to determine Torpedo damage based on bleed through? It’s a perfect 10% isn’t it? I’ve been testing against unshielded targets – determining the damage of a single torp isn’t a problem, it’s getting the damage of 10-20 torps at each range to get an average that’s a pain, as most targets are destroyed after two or three hits, and then I have to restart the mission to get another two or three results. Ah, well, it’s something to think about, since I doubt there are that many unshielded targets in the game that can withstand 20+ torpedoes. Thanks for the tip – I’ll look out for the mission. May I suggest that you determine that, whenever you get around to testing resists, you try to see if there’s such a thing as negative resists? Basically hit a target that has no resists with a resist debuff and from there determine if there’s a damage bonus. I think plasma torpedoes losing strength with distance is canon. I wouldn’t think photons were the same. Haven’t tried them in game, so it might just be my SFB bias. With regard to plasma torpedos losing strength with distance versus a photon torpedo, and plasma torpedo is still an energy weapon. Energy dissapates. A photon torpedo, despite the name, is an antimatter warhead, and thus doesn’t lose any energy until it detonates. If the game is set up correctly, the photon torpedo shouldn’t lose any energy over distance. You mentioned lack of good testing for projectiles. The Divide Et Imperia mission where you ahve to put transwarp mines in place involves destroying asteroids, which then shatter into smaller asteroids. At 1 km away using high yield plasmas it was taking me 2 plus shots plus beam weapons to destroy the big ones, so maybe that would be a good place to test projectile weapons. Oops never mind I got the name wrong its minefiled and someone beat me too it. Love the info and almost every question i had was answerd. One thing i have been wondering is the (dps) that items show is that at max range or in close range or is it in between. The Damage and DPS shown on weapon tooltips assumes minimum range (see the Energy Weapons Summary section). Ever thought of finding a human player and testing that way, I know if you drop you shield power to 0 they will drop, or at least that’s is what I am told that way you could fire and both of you would have data. Also a good way to see data on how much damage bleeds throw the shields. What I would like to know is are different beam types rang effect differently, (Phasers, Disrupters, so on) or are they the same? As far as I’ve been able to tell so far, the energy type (phaser, disruptor, etc) doesn’t have any impact on range, just whether the weapon is a beam or a cannon. for your torpedo testing with damage vs the amount of time its flying would be easy to tes with another player. have the other player start at 10km stationary. fire a torpedo see what the bleed through is. fire a second torpedo have other player start moving at 1/3 impulse check bleed through. start again at 10k stationary fire torpedo have player fly off at 1/2 impulse…etc.etc. Yup, it would be easy if there was a simple way to arrange a duel with another player.